Abrahamic religion spread globally through Christianity being adopted by the Roman Empire in the 4th century and Islam by the Islamic Empires from the 7th century. Today the Abrahamic religions are one of the major divisions in comparative religion (along with Indian, Iranian, and East Asian religions). The major Abrahamic religions in chronological order of founding are Judaism (the base of the other two religions) in the 7th century BCE,  Christianity in the 1st century CE, and Islam in the 7th century CE. It was suggested by Louis Massignon that the phrase "Abrahamic religion" means that all these religions come from one spiritual source. Paul the Apostle referred to Abraham as the "father of us all". [Rom. 4] There is a Quranic term, millat Ibrahim, 'religion of Ibrahim',   indicating that Islam sees itself as standing in a tradition of religious practice from Abraham. Jewish tradition claims that the Jews are descended from Abraham, and adherents of Judaism derive their spiritual identity from Abraham as the first of the three "fathers" or biblical Patriarchs: Abraham, Isaac, and Jacob. Christianity began in the 1st century as a sect within Judaism initially led by Jesus. His followers viewed him as the Messiah, as in the Confession of Peter; after his crucifixion and death they came to view him as God incarnate,  who was resurrected and will return at the end of time to judge the living and the dead and create an eternal Kingdom of God. Within a few decades the new movement split from Judaism. However, some of the restriction of Abrahamic to these three is due only to tradition in historical classification. Therefore, restricting the category to these three religions has come under criticism. The religions listed below here claim Abrahamic classification, either by the religions themselves, or by scholars who study them. Samaritanism is based on some of the same books used as the basis of Judaism but differs from the latter. Samaritan religious works include the Samaritan version of the Torah, the Memar Markah, the Samaritan liturgy, and Samaritan law codes and biblical commentaries. Many[ who?] claim the Samaritans appear to have a text of the Torah as old as the Masoretic Text; scholars have various theories concerning the actual relationships between these three texts. According to Izady, Yazdânism is now continued in the denominations of Yazidism, Yarsanism, and Alevism. The three traditions subsumed under the term Yazdânism are primarily practiced in relatively isolated communities, from Khurasan to Anatolia and parts of western Iran. The Rasta movement is organised on a largely cellular basis. There are several denominations, or " Mansions of Rastafari", the most prominent of which are the Nyahbinghi, Bobo Ashanti, Ethiopian Zion Coptic Church, and the Twelve Tribes of Israel, each of which offers different interpretations of Rasta belief. There are an estimated 700,000 to 1 million Rastas across the world; the largest population is in Jamaica although communities can be found in most of the world's major population centres. 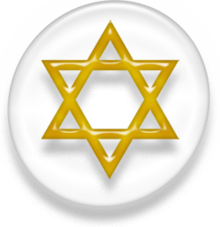 Judaism regards itself as the religion of the descendants of Jacob, [n 1] a grandson of Abraham. It has a strictly unitary view of God, and the central holy book for almost all branches is the Masoretic Text as elucidated in the Oral Torah. In the 19th century and 20th centuries Judaism developed a small number of branches, of which the most significant are Orthodox, Conservative, and Reform. Christianity began as a sect of Judaism [n 2] in the Mediterranean Basin [n 3] of the first century CE and evolved into a separate religion—Christianity—with distinctive beliefs and practices. Jesus is the central figure of Christianity, considered by almost all denominations to be God the Son, one person of the Trinity. (See God in Christianity. [n 4]) The Christian biblical canons are usually held to be the ultimate authority, alongside sacred tradition in some denominations (such as the Catholic Church and the Eastern Orthodox Church). 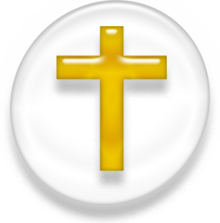 Over many centuries, Christianity divided into three main branches (Orthodox, Catholic, and Protestant), dozens of significant denominations, and hundreds of smaller ones. Islam arose in the Arabian Peninsula [n 5] in the 7th century CE with a strictly unitary view of God. [n 6] Muslims hold the Quran to be the ultimate authority, as revealed and elucidated through the teachings and practices [n 7] of a central, but not divine prophet, Muhammad. The Islamic faith considers all prophets and messengers from Adam through the final messenger (Muhammad) to carry the same Islamic monotheistic principles. Soon after its founding, Islam split into two main branches (Sunni and Shia Islam), each of which now has a number of denominations. Muslims see Isa as a Prophet of Islam  and Messiah. Jerusalem was an early center of Christianity. There has been a continuous Christian presence there since. William R. Kenan, Jr., professor of the history of Christianity at the University of Virginia, Charlottesville, writes that from the middle of the 4th century to the Islamic conquest in the middle of the 7th century, the Roman province of Palestine was a Christian nation with Jerusalem its principal city. According to the New Testament, Jerusalem was the city Jesus was brought to as a child to be presented at the temple [Luke 2:22] and for the feast of the Passover. 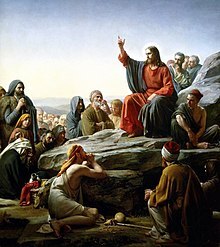 [Luke 2:41] He preached and healed in Jerusalem, unceremoniously drove the money changers in disarray from the temple there, held the Last Supper in an "upper room" (traditionally the Cenacle) there the night before he is said to have died on the cross, was arrested in Gethsemane. The six parts to Jesus' trial—three stages in a religious court and three stages before a Roman court—were all held in Jerusalem. His crucifixion at Golgotha, his burial nearby (traditionally the Church of the Holy Sepulchre), and his resurrection and ascension and prophecy to return all are said to have occurred or will occur there. The national god of the Israelites has a proper name, written YHWH ( Hebrew: יְהֹוָה, Modern: Yehovah, Tiberian: Yəhōwāh) in the Hebrew Bible. The name YHWH is a combination of the future, present, and past tense of the verb "howa" ( Hebrew: הוה‎) meaning "to be" and translated literally means "The self-existent One". A further explanation of the name was given to Moses when YHWH stated Eheye Asher Eheye ( Hebrew: אהיה אשר אהיה‎) "I will be that I will be", the name relates to God as God truly is, God's revealed essence, which transcends the universe. It also represents God's compassion towards the world. In Jewish tradition another name of God is Elohim, relating to the interaction between God and the universe, God as manifest in the physical world, it designates the justice of God, and means "the One who is the totality of powers, forces and causes in the universe". In Christian theology, God is the eternal being who created and preserves the world. Christians believe God to be both transcendent and immanent (involved in the world). Early Christian views of God were expressed in the Pauline Epistles and the early [n 9] creeds, which proclaimed one God and the divinity of Jesus. In Islamic theology, God ( Arabic: الله‎ Allāh) is the all-powerful and all-knowing creator, sustainer, ordainer and judge of everything in existence. Islam emphasizes that God is strictly singular ( tawḥīd)  unique (wāḥid) and inherently One (aḥad), all-merciful and omnipotent. According to Islamic teachings, God exists without place  and according to the Quran, "No vision can grasp him, but His grasp is over all vision: He is above all comprehension, yet is acquainted with all things." God, as referenced in the Quran, is the only God. Islamic tradition also describes the 99 names of God. These 99 names describe attributes of God, including Most Merciful, The Just, The Peace and Blessing, and the Guardian. 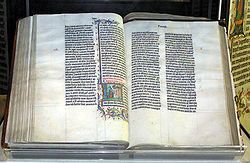 The sacred scriptures of the Christian Bible are complemented by a large body of writings by individual Christians and councils of Christian leaders (see canon law). Some Christian churches and denominations consider certain additional writings to be binding; other Christian groups consider only the Bible to be binding ( sola scriptura). Shia Muslims, however, refer to other authenticated hadiths instead. They are known collectively as The Four Books. The Quran contains repeated references to the "religion of Abraham" (see Suras 2:130,135; 3:95; 6:123,161; 12:38; 16:123; 22:78). In the Quran, this expression refers specifically to Islam; sometimes in contrast to Christianity and Judaism, as in Sura 2:135, for example: 'They say: "Become Jews or Christians if ye would be guided (to salvation)." Say thou (O Muslims): "Nay! (I would rather) the Religion of Abraham the True, and he joined not gods with God." ' In the Quran, Abraham is declared to have been a Muslim (a hanif, more accurately a " primordial monotheist"), not a Jew nor a Christian (Sura 3:67). Christians have more diverse and definite teachings on the end times and what constitutes afterlife. Most Christian approaches either include different abodes for the dead ( Heaven, Hell, Limbo, Purgatory) or universal reconciliation because all souls are made in the image of God. A small minority teach annihilationism, the doctrine that those persons who are not reconciled to God simply cease to exist. Worship, ceremonies and religion-related customs differ substantially among the Abrahamic religions. Among the few similarities are a seven-day cycle in which one day is nominally reserved for worship, prayer or other religious activities— Shabbat, Sabbath, or jumu'ah; this custom is related to the biblical story of Genesis, where God created the universe in six days and rested in the seventh. The followers of Islam (Muslims) are to observe the Five Pillars of Islam. The first pillar is the belief in the oneness of Allah, and in Muhammad as his final and most perfect prophet. The second is to pray five times daily ( salat) towards the direction ( qibla) of the Kaaba in Mecca. The third pillar is almsgiving ( Zakah), a portion of one's wealth given to the poor or to other specified causes, which means the giving of a specific share of one's wealth and savings to persons or causes, as is commanded in the Quran and elucidated as to specific percentages for different kinds of income and wealth in the hadith. The normal share to be paid is two and a half percent of one's earnings: this increases if labour was not required, and increases further if only capital or possessions alone were required (i.e. proceeds from renting space), and increases to 50% on "unearned wealth" such as treasure-finding, and to 100% on wealth that is considered haram, as part of attempting to make atonement for the sin, such as that gained through financial interest ( riba). Fasting ( sawm) during the ninth month of the Muslim lunar calendar, Ramadan, is the fourth pillar of Islam, to which all Muslims after the age of puberty in good health (as judged by a Muslim doctor to be able fast without incurring grave danger to health: even in seemingly obvious situations, a "competent and upright Muslim physician" is required to agree), that are not menstruating are bound to observe—missed days of the fast for any reason must be made up, unless there be a permanent illness, such as diabetes, that prevents a person from ever fasting. In such a case, restitution must be made by feeding one poor person for each day missed. Finally, Muslims are also required, if physically able, to undertake a pilgrimage to Mecca at least once in one's life: it is strongly recommended to do it as often as possible, preferably once a year. Only individuals whose financial position and health are severely insufficient are exempt from making Hajj (e.g. if making Hajj would put stress on one's financial situation, but would not end up in homelessness or starvation, it is still required). During this pilgrimage, the Muslims spend three to seven days in worship, performing several strictly defined rituals, most notably circumambulating the Kaaba among millions of other Muslims and the " stoning of the devil" at Mina. The Roman Catholic Church believes in observing abstinence and penance. For example, all Fridays through the year and the time of Lent are penitential days. The law of abstinence requires a Catholic from 14 years of age until death to abstain from eating meat on Fridays in honor of the Passion of Jesus on Good Friday. The United States Conference of Catholic Bishops obtained the permission of the Holy See for Catholics in the U.S. to substitute a penitential, or even a charitable, practice of their own choosing. Eastern Rite Catholics have their own penitential practices as specified by the Code of Canons for the Eastern Churches. Moses Maimonides, one of the major Jewish teachers, commented: "Quoting from our sages, the righteous people from other nations have a place in the world to come if they have acquired what they should learn about the Creator". Because the commandments applicable to the Jews are much more detailed and onerous than Noahide laws, Jewish scholars have traditionally maintained that it is better to be a good non-Jew than a bad Jew, thus discouraging conversion. In the U.S., as of 2003 28% of married Jews were married to non-Jews. See also Conversion to Judaism. In most of their common history, the three Abrahamic religions have been "ignorant about each other, or worse, especially in the case of Christians and Muslims, attacked each other." In the La Convivencia (The Coexistence) in the 14th and 15th centuries, Muslims, Christians and Jews co-existed in relative peace, but, otherwise, there has been "very little genuine dialogue" between believers in these Abrahamic religions. They have "kept their distance from one another, or were in conflict. . . there has been very little genuine dialogue." An aspect La Convivencia is shown in a six-minute video Cities of Light that documents collaboration between Spanish Jewish, Muslim and Christian scientists in 12th century Spain. It features the works of Maimonides (Jewish philosopher) and Averroes (Muslim philosopher). The Crusades (end of 11th – end of 13th century CE) were a series of military expeditions from Western Europe to the Southern and Eastern Mediterranean: a rather unsuccessful response by Western (Catholic) Christians to aid their Eastern counterparts in retaking what was perceived by all Christians as the Holy Land from its Muslim inhabitants. In passing, Crusades were also marked with conflicts between Western and Eastern ( Orthodox, Syro-Jacobite and Armenian) Christians and unilateral damage inflicted by Western Christians to Jews along the path of travel and in the Holy Land. Lawson, Todd (13 December 2012). Cusack, Carole M.; Hartney, Christopher, eds. "Baha'i Religious History". Journal of Religious History. 36 (4): 463–470. doi: 10.1111/j.1467-9809.2012.01224.x. ISSN 1467-9809. Retrieved 5 September 2013. ^ a b Lawson, Todd (13 December 2012). Cusack, Carole M.; Hartney, Christopher, eds. "Baha'i Religious History". Journal of Religious History. 36 (4): 463–470. doi: 10.1111/j.1467-9809.2012.01224.x. ISSN 1467-9809. Retrieved 5 September 2013. ^ Johnson, Todd M.; Brian J. Grim (26 March 2013). "Global Religious Populations, 1910–2010". The World's Religions in Figures: An Introduction to International Religious Demography. John Wiley & Sons. pp. 59–62. doi: 10.1002/9781118555767.ch1. ISBN 9781118555767. ^ a b A. Vinogradov, "Ethnicity, Cultural Discontinuity and Power Brokers in Northern Iraq: The Case of the Shabak", American Ethnologist, pp. 214–215, American Anthropological Association, 1974. doi: 10.1525/ae.1974.1.1.02a00110. JSTOR 643810. Mayton, Daniel M. (2009). "Nonviolent Perspectives Within the Abrahamic Religions". Nonviolence and Peace Psychology. Peace Psychology Book Series. Springer US. pp. 167–203. doi: 10.1007/978-0-387-89348-8_7. ISBN 978-0-387-89348-8. Bacquet, Karen (May 2006). "When Principle and Authority Collide: Baha'i Responses to the Exclusion of Women from the Universal House of Justice". Nova Religio: The Journal of Alternative and Emergent Religions. 9 (4): 34–52. doi: 10.1525/nr.2006.9.4.034. JSTOR 10.1525/nr.2006.9.4.034. ^ Kunst, J. R.; Thomsen, L. (2014). "Prodigal sons: Dual Abrahamic categorization mediates the detrimental effects of religious fundamentalism on Christian-Muslim relations". The International Journal for the Psychology of Religion. 25 (4): 1–14. doi: 10.1080/10508619.2014.937965. ^ Kunst, J.; Thomsen, L.; Sam, D. (2014). "Late Abrahamic reunion? Religious fundamentalism negatively predicts dual Abrahamic group categorization among Muslims and Christians". European Journal of Social Psychology. 44 (4): 337. doi: 10.1002/ejsp.2014. ^ Slosar, J. P.; O'Brien, D. (2003). "The Ethics of Neonatal Male Circumcision: A Catholic Perspective". American Journal of Bioethics. 3 (2): 62–64. doi: 10.1162/152651603766436306. PMID 12859824. ^ Adams, Gregory; Adams, Kristina (2012). "Circumcision in the Early Christian Church: The Controversy That Shaped a Continent". In Bolnick, David A.; Koyle, Martin; Yosha, Assaf. Surgical Guide to Circumcision. London: Springer. pp. 291–298. doi: 10.1007/978-1-4471-2858-8_26. ISBN 978-1-4471-2857-1. Retrieved 6 April 2014. (Subscription required (help)). ^ Richters, J.; Smith, A. M.; de Visser, R. O.; Grulich, A. E.; Rissel, C. E. (August 2006). "Circumcision in Australia: prevalence and effects on sexual health". Int J STD AIDS. 17 (8): 547–54. doi: 10.1258/095646206778145730. PMID 16925903. ^ Williams, B. G.; et al. (2006). "The potential impact of male circumcision on HIV in sub-Saharan Africa". PLoS Med. 3 (7): e262. doi: 10.1371/journal.pmed.0030262. PMC 1489185. PMID 16822094. ^ According to Encyclopedia Talmudit (Hebrew edition, Israel, 5741/1981, Entry Ben Noah, page 349), most medieval authorities consider that all seven commandments were given to Adam, although Maimonides ( Mishneh Torah, Hilkhot M'lakhim 9:1) considers the dietary law to have been given to Noah.